Ferrari team boss Marco Mattiacci has a lot on his plate as he seeks to turn the team around but one task overshadows all others. Mattiacci has to find a way to convince Fernando Alonso to stay, because it has become abundantly apparent just how bad Ferrari would have looked in the last few years without him. Despite all their efforts, Ferrari seem unable to get closer to the ultimate pace. In fact, the car's performance has got further and further away since Alonso joined in 2010. And now they are way beyond the point at which even Alonso can hide Ferrari's shortcomings and keep up a title challenge - as he did against the odds in 2012. They look pretty bad already, even with Alonso carrying Ferrari on his back for the last few years. Just imagine how they would look if he cannot be convinced that Ferrari will sort themselves out before the opposition, and he decides to accept the effectively open chequebook he has been offered by McLaren-Honda, for example. And if Ferrari lost the drive and determination of Alonso, that could only destabilise the team further. However many northern Europeans work there, Ferrari is still a southern European team in character. It runs with flourish and passion, and Alonso gives them that. They know that and they love that side of him, even if he probably needles them at times because he is so demanding. 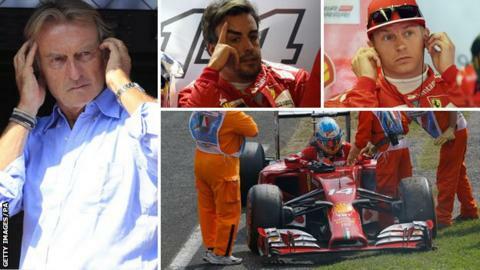 In some ways, Alonso has probably lengthened the time it took Ferrari to realise how bad they were, by dragging them to fight for world titles and giving them results they did not deserve. But there is no doubt any more. Over the season so far, Ferrari are 0.2 seconds per kilometre slower than the Mercedes. So on a typical 5km track, Ferrari will be a second off the pace. Fernando Alonso has scored 121 points so far this season, nearly three times more than his team mate Kimi Raikkonen, who only has 41 points. To qualify seventh and 12th at their home grand prix in Italy last weekend and finish ninth with the only car that got to the end - Kimi Raikkonen's - is clearly not good enough. Earlier this week, Ferrari president Luca Di Montezemolo paid the price for the team's lack of performance. For Alonso, this is a very unsettling period. Di Montezemolo, with whom he had a difficult relationship, is out. There is a new team principal in Mattiacci. The engine boss, Luca Marmorini, was sacked in the summer. Ferrari's current situation reminds me of the early 1990s. Back then, with a succession of Fiat managers in charge, they were nowhere. They fired Alain Prost at the end of 1991 - an incredibly bad decision. And 1992, 1993 and 1994 were dreadful years. The slide was only stopped when first Jean Todt came on board as team boss, then Michael Schumacher, Ross Brawn and Rory Byrne, and they built the team into a dominant force over a number of years. It took that group of very strong individuals to get Ferrari on to an even keel, and now they have gone the team have slipped inexorably backwards. But Di Montezemolo's departure gives them a chance to start again with a new approach. That can't be a bad thing, because there has clearly been something fundamentally wrong with the team with Di Montezemolo in overall charge. Ferrari currently sit in 4th place in the Constructors' Championship, 292 points behind leaders Mercedes. The timing data from the Italian Grand Prix underlined Ferrari's lack of competitiveness. They were 3km/h down on top speed at the end of the pit straight relative to Mercedes. They were on average 2km/h down at the speed traps at the end of each sector. The Ferrari engine's lack of power and driveability is well known, but things looked just as bad on the car front. The middle sector of the lap is the one with most of the corners - the second chicane and both Lesmos and then the run down to the Ascari chicane. And that was their least competitive sector - they were 0.65secs off the pace. The foundations for recovery are there, though. In Alonso, they have the Schumacher. In Allison they have a very highly regarded design leader, the Byrne figure, with elements of Brawn thrown in as well. The question is whether Mattiacci can emulate Todt and hold it all together. Mattacci is very new and has to be given time to prove himself. He is highly regarded within parent company Fiat, and he has already made it clear that he knows it's not a case of Ferrari being close and just needing a few little tweaks here and there. There is a rebuilding job to do for the future. I am interested to see if he can use his experience in other industries to turn the fortunes of the scarlet cars around in the same way Flavio Briatore did with Benetton in the early '90s. Every area needs to be looked at and I would be questioning Raikkonen's position. Felipe Massa was ousted last season because he was not measuring up, and Raikkonen is doing no better than him compared to Alonso, who admittedly is about as tough a team-mate as you could have. Ferrari's last World Champion was Kimi Raikkonen in 2007. He has struggled with form on his return. In signing Kimi Raikkonen for this season, I thought they had given themselves the best possible line-up. I thought they would, if they had a half-decent car, win the constructors' championship and that one of them, whoever turned out best, would have a good chance of the drivers' title. Alonso's average qualifying position this year is seventh; Raikkonen's is 10th. The only times Raikkonen has finished ahead in a race was in Spa, when Alonso was delayed with a penalty, and Monza, when Alonso retired with an engine problem. While it's clear Raikkonen has not been happy with the way the car behaves this year and should be given some time to sort himself out, there are some fantastic young drivers emerging who are putting pressure on that situation. Sergio Perez has been doing a terrific job for Force India recently, putting the highly regarded Nico Hulkenberg in the shade. Perez still has associations with the Mexican billionaire Carlos Slim, who is on the board of Philip Morris, which owns Marlboro, which is still Ferrari's title sponsor. Valtteri Bottas and Daniel Ricciardo have shone for Williams and Red Bull but they are both under contract and the same goes for Sebastian Vettel, who Ferrari have been interested in for a while and is almost certainly unsettled at the moment, given Ricciardo's performances this year. But I would also be looking elsewhere, even if that meant having to pay Raikkonen off for a second time, as they did at the end of 2009 to make way for Alonso. Jules Bianchi continues to impress for Marussia and he's a member of the Ferrari driver programme, so there would be no contractual issues. Raikkonen has already said this year that he will probably retire from F1 when his current contract expires - it lasts until the end of next year with an option for 2016. So you have to ask how committed he is to next year, if he is already coming out with remarks like that. If I was running Ferrari, I would want more results out of Raikkonen before the end of the year or I would be looking at the options.